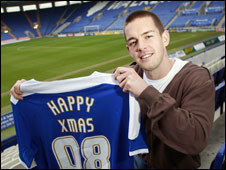 Leicester City striker Matty Fryatt has signed a new three-and-a-half-year deal with the Foxes. There had been fears the striker, with 23 goals this season, would be snapped up by another club in January with his contract running out in the summer. Fryatt told BBC Radio Leicester: "It puts all the speculation to bed. I've wanted it to be sorted for a while now but it's dragged a bit. "I want to carry on with the form I'm in and hopefully gain promotion." Leicester are now four points clear at the top of League One after a 4-0 win over Peterborough on Saturday. Their next test is a high-profile League One clash at Leeds away on Boxing Day.